The art of carving requires the experience of finding the right wood grain. The ebb and flow of the wood and its texture can bring a sculpture alive. Let us look closer at how the wood speaks and how an Artisan listens. First things first is to choose the wood to be used for a specific Client's choice of Sculpture. Depending on what the log will be carved to be, will direct Doug to the best type of tree log that reflects its character. Do the rings match? Are there knots that can be used? Does wood color have unique traits? In this case, we are looking at wood for an Eagle. 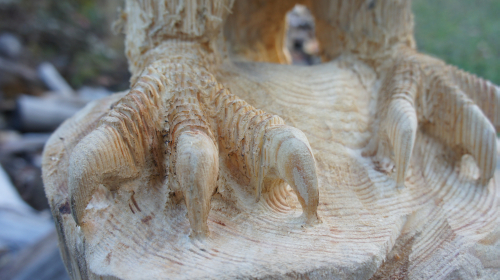 Here is an example of rings, color uniqueness and special features within the tree log that can be used to bring character and life to the Sculpture. Remember, it all starts with a chainsaw carving the foundation of the image. 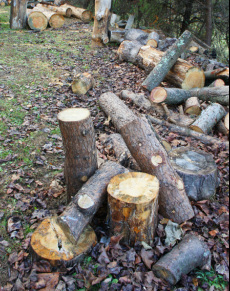 Once a tree log is chosen, the bark is completely removed. Doug can then use his experience and imagination to eye the wood for its many possibilities. "Should the face be here? Are the natural bumps in the log perfect for specific features?"